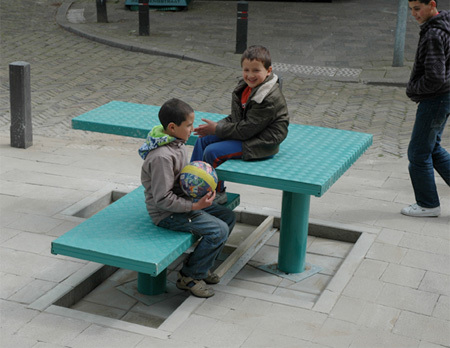 Carmela Bogman and Rogier Martens have designed a new kind of outdoor furniture that can be pumped out of the pavement by the inhabitants. Hydraulic system allows the furniture to be fixed at any height. 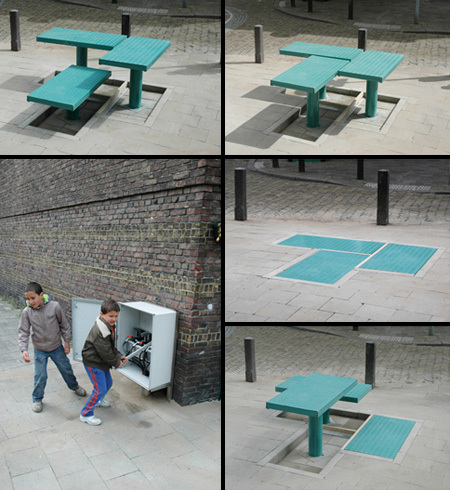 This means that you can decide whether you want to create a bench or a picnic table. After use it can be pumped back and it will disappear into the ground. 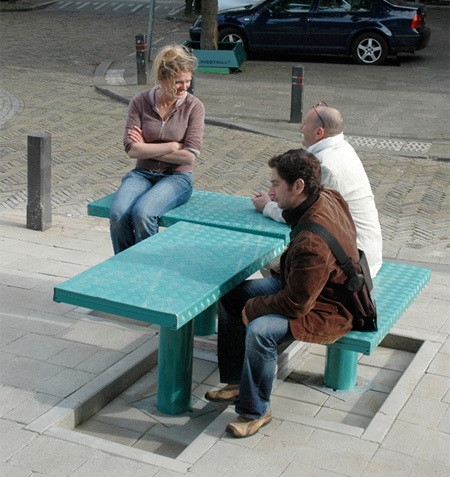 The first Pop Up was installed in the city of Utrecht in the Netherlands. To ensure safety, several control keys were spread among the locals in the neighborhood. The keys give access to the pumping system. Third picture: would you sit/eat/rest on something people walked/cycled all over on? can you just say something good for a change rather than criticizing everything you see here and say its bad. That really doesnt help. Wow, that’s a really sweet idea. I think it’d be better if they sorta put a mini-fence/signs prohibiting people to walk/jog/run/cycle/drive/hop/skip/travel in anyway over it to prevent it from getting dirty. This is an awesome idea, it can be used at low traffic areas. Great for skaters who’d love to take a break. I think this would be cool with vending machines. Maybe even toilets, though they would lock in place until sensors detect nobody inside. Could be really cool. It gives rise to the idea of the use of space. Cool, but like Chiggly said, they should put a fence around it. @miggy: no i can’t, not if i think its unnecessary/can be improved/ugly. and this falls right in that venn diagram, sorry. the fence thing will work to keep people from walking all over it, but then so will an ordinary, non-pop up bench. same area, right? as for “To ensure safety, several control keys were spread among the locals in the neighborhood. The keys give access to the pumping system.”, i say: too much trouble just to “save” a bit of space. People there probably have the courtesy to avoid walking over the area, knowing that it’s a pop up table and seeing the change in color. Interesting idea, but not the most practical. I read your comment and seriously lol’d. Plus, I’m at work so it was extra awkward. Thanks for that, bro. This is neat, and very cool as art, but completely impractical. I agree with others here. There are also issues with stones, lunch trash, and other things that might get stuck under the benches and interfere with their closing. Without extra drainage, rain will pool under there and promote mosquito (and other nasty) growth. That’s a real problem around here. Of course, rain may just collect into the pump system, which would be another problem. As far as foot traffic, looks like this was placed right at the end of a crosswalk, pretty much guaranteeing heavy (for the area) traffic. In cities around here, that would mean gum, trash, dog crap and other lovely things on the table or bench. Over time, as the table gets bent up from foot traffic (ever see the metal grates on a sidewalk in a large city?) or the stones around/under it raise up and drop with frost heaves, the table will stop closing correctly and will become a tripping hazard. So, looks really cool, is very unique, but is not practical, IMHO. It’s like those home makeovers on HGTV: looks really cool when they finish, but falls apart in 6 months. A pop up bench?? Why bother, can’t tax money go to something of better use! Like a youth club for kids . . .? Wonder how much it cost? It is pretty cool though, never seen anything like it before! To all those who are worried about safety and want to bubble wrap their children… read the captions… “To ensure safety, several control keys were spread among the locals in the neighbourhood. 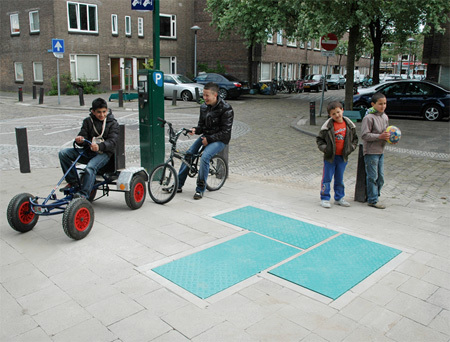 The keys give access to the pumping system.” This is an awesome piece of multi-functional street furniture.